I’m really looking forward to getting dried out soon, well to be exact it’s not actually me that needs drying out, but the fields we have and in particular the sheep fields. Apart from the fact that the fields can get very muddy, the wet causes us problems with the sheep. Over recent weeks we have had to deal with a few ‘limpers’. Due to the wet conditions underfoot, it can cause a condition called scald, where the sheep get sore between their hoof. As I have done this week, with Skippy and Stanley, I get the sheep into the pen and then single out each affected sheep, clean their feet off and whilst they are drying off, I will use that time to trim their hooves if required. Then my magic blue spray comes out and I treat the feet of each affected animal. It is amazing how well this method works, because invariably, within 24 hours, those that were previously hobbling around the field are skipping and leaping about like they are as good as new. 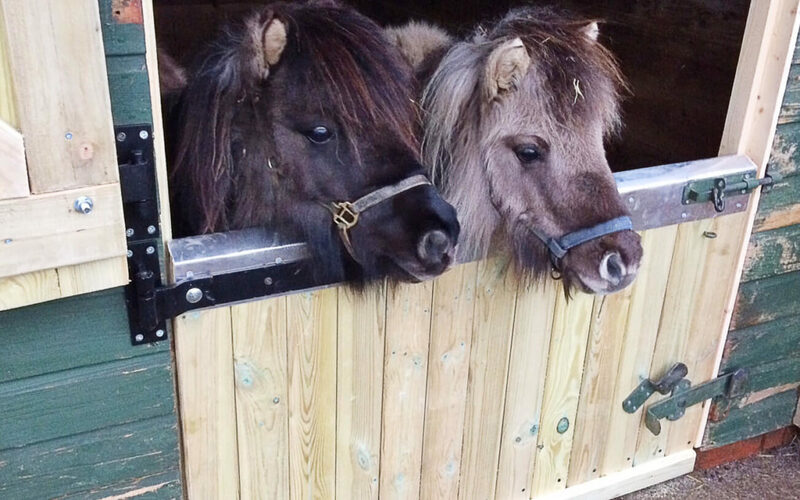 We surprised our Shetland ponies this week. In the small paddock they use during the winter months they have a shelter but rarely use it – which came as a surprise to me. From time to time we may be out somewhere, away from the farm, when it starts raining or it gets dark and generally I don’t get the women folk to put the animals away in my absence. Well, we were talking about the situation recently and Wendy came up with an idea. Of course, I could put the ponies inside their stable before going out so they wouldn’t get soaked before it gets dark, but because the stable door is a couple of feet taller than they are, the stable is already dark. The pair of them are only 31 inches tall and so they cannot see anything over the stable door as it is a good 18 inches taller than they are. That is, until this week. We have just had a new stable door made and fitted, so now when we go out on a jaunt we can put the ponies safely inside and from there they can watch the world go by with their heads over the door, plus our girls don’t need to struggle to put them in. I’d say that’s a great result all round. With the weather warming up ever so slightly over recent days, it has been nice spending more time outdoors – even when there hasn’t been jobs to do. That includes in the evenings after it has started getting dark. It is during those downtime moments in the evening when I get to do one of my favourite things, which is to just stand and listen. That’s when you get to hear so much more than when you are rushing about doing what you do during the day and it is when sounds become so much more vivid and alive. I suppose it helps having less background noise to deal with. As I walk around the farm and pause from time to time I hear the sheep, who are now all laying down, gently chewing away their cares and I hear the lapwings playing in the darkness across the field. I hear the croaking frogs at the water’s edge calling to each other in the night, then there are the rooks chattering away, high up in the silver birch trees, as they settle down for the night. Then, just before heading back into the house comes what sounds like a sandpaper block on a piece of timber, that’ll be the pigs then, having a good old scratch against the chestnut tree before bed.